(BOSTON) —Last year, a Wyss Institute team of scientists described the development of a new device to treat sepsis that works by mimicking our spleen. 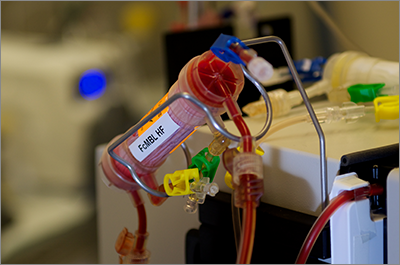 It cleanses pathogens and toxins from blood circulating through a dialysis-like circuit. Now, the Wyss Institute team has developed an improved device that synergizes with conventional antibiotic therapies and that has been streamlined to better position it for near-term translation to the clinic. The improved design is described in the October volume 67 of Biomaterials. Sepsis is a common and frequently fatal medical complication that can occur when a person’s body attempts to fight off serious infection. Resulting widespread inflammation can cause organs to shut down, blood pressure to drop, and the heart to weaken. This can lead to septic shock, and more than 30 percent of septic patients in the United States eventually die. In most cases, the pathogen responsible for triggering the septic condition is never pinpointed, so clinicians blindly prescribe an antibiotic course in a blanket attempt to stave off infectious bacteria and halt the body’s dangerous inflammatory response. But sepsis can be caused by a wide-ranging variety of pathogens that are not susceptible to antibiotics, including viruses, fungi and parasites. What’s more, even when antibiotics are effective at killing invading bacteria, the dead pathogens fragment and release toxins into the patient’s bloodstream. The Wyss team’s blood-cleansing approach can be administered quickly, even without identifying the infectious agent. This is because it uses the Wyss Institute’s proprietary pathogen-capturing agent, FcMBL, that binds all types of live and dead infectious microbes, including bacteria, fungi, viruses, as well as toxins they release. FcMBL is a genetically engineered blood protein inspired by a naturally-occurring human molecule called Mannose Binding Lectin (MBL), which is found in the innate immune system and binds to toxic invaders, marking them for capture by immune cells in the spleen. “Seeing our system work in animal models gives us confidence that this could work in humans, because we are successfully treating animals infected with human pathogens,” said Wyss Senior Staff Scientist Michael Super, Ph.D., who works on the Institute’s Advanced Technology Team and is also an author on the new study. This work was supported by the Defense Advanced Research Projects Agency and the Wyss Institute for Biologically Inspired Engineering at Harvard University.